There is just over 100 days to go before this summer's Olympics, but Russia's synchronized swimmers have already flown to London to take part in a qualifying tournament. 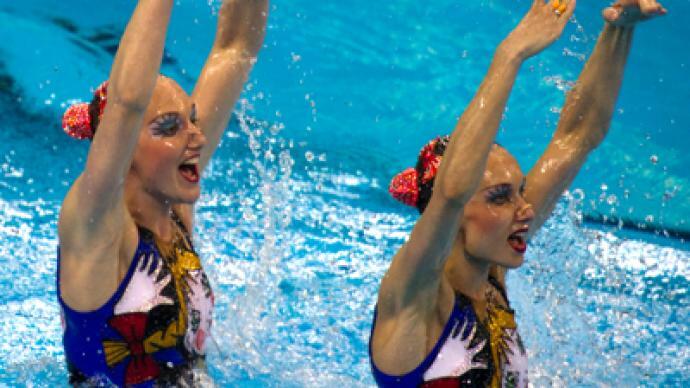 Russia’s synchronized swimming team and duet have won all six possible gold medals in the last three Olympic Games. In addition, they have also contributed heavily to Russia’s overall gold medal tally in both the World and European Aquatics Championships. But whether or not their challengers have dropped their standards in recent times, it’s clear the current batch of Russian athletes are being trained hard. “We really work a lot. Everyone at the training facility knows this. They are all shocked that we train daily for 10 hours. Honing and polishing the routine is very difficult and to remember it is even harder,” the team’s coach Tatyana Danchenko says. Although it was removed in favor of the team competition for the 1996 Games, the duet is now considered to be the most prestigious event of all. Russia’s Anastasia Davydova and Anastasia Ermakova were the country’s star pair at the last two Olympics. But a couple of new starlets, in the form of Natasha Ischenko and Svetlana Romashina, have emerged at recent World and Euro Championships. “It’s much tougher physically this time round, because in the last Olympics I only participated in the team competition and now I will also be performing in the duet competition. It’s a more individual event and is of course very prestigious and because of that it’s more than double the work,” says Ischenko. The discipline requires great strength, endurance, flexibility and of course precise timing, as well as exceptional breath control when upside down underwater. So training is tough and lengthy as the girls can train for literally half a day in order to ensure they maintain the proper level of fitness. “Without a doubt the most difficult aspect is dealing with the physical demands, we’ve got two duet repetitions in the morning and two team repetitions in the evening, so it’s quite difficult to keep yourself in shape. Mentally it’s also tough. Yes, the Olympics are the goal, but you try not to think about that, because it just becomes that much harder,” notes Romashina. Ishenko and Romashina, of course, spend a lot of time in the water, but it’s surprising that they spend an equal amount of their 10 hour training sessions in the gym, practicing their choreography. It’s a long and at times lonely task with a rigid regime, that leaves little room for anything else, let alone free-time. But Ishenko insists there’s enough time for friends and family. “We have one free day a week, so we try to get everything done then. Like go to the movies and meet with friends. I have a husband at home, so I like spending time with him of course, but this is part of our work and you just have to get used to it,” she says.